I know we are midway through our India journey but I am going to divert the group to Italy for a quick break. On friday I, and a few other fantastic ladies, were given a challenge to create a salad with a difference. I knew I had a great red bean salsa to share already, and a tuna salad which could be converted into a tasty variation on coleslaw if you left out the tuna. However I wanted to give my friend something new and special to do. The inspiration came from JamieWho with his devine looking "Caprese Salad" soup. I knew exactly which salad to make but decided that a regular caperese salad would be, well, regular and decided to make a slight variation on it. Something that brings out the sweetness of the tomatoes. Brush a baking tray with the mixture and place the tomatoes on top. Remove the tray, flip the tomatoes and brush the other side. Replace it under the grill. When done, place on a plate, break the mozzarella over the tomatoes and sprinkle the leaves. What a lovely winterized version of caprese salad! Its all JamieWho's fault :) but I enjoyed it and the caramlised balsamic was just wow. 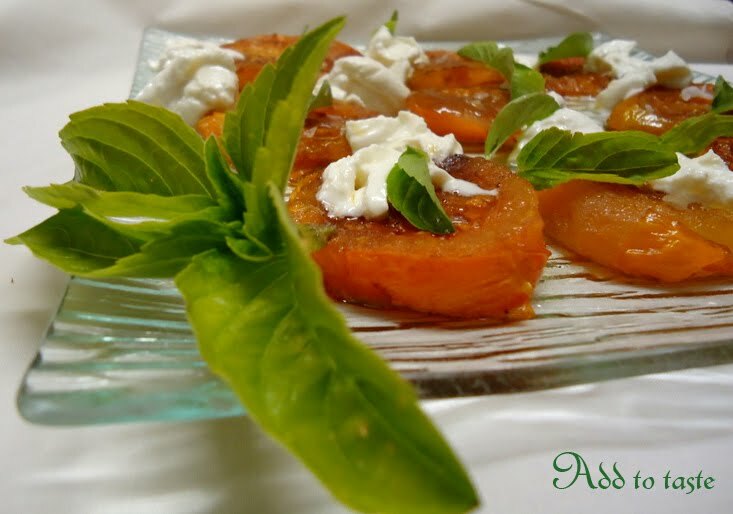 What a delicious version of the caprese! Can also try this: top a tomato, scoop out the innards, and pop a small mozzarella ball and a teaspoon of basil pesto inside. Top with the tomato cap, and pop under the grill until the tomato starts to brown and the cheese melts. It's divine, we had it at Christmas. wow that really does sound good. I will try it next time! Love the idea... Nice for winter.